Theories of change need to be grounded in context and derived from an understanding of complexity. Starting new projects –or scaling proved projects in new contexts- is complex. Applied to development complexity happens when there are high levels of social disagreement and low levels of technical expertise. Since projects are complex emergence, nonlinearity, and systems thinking are important for both project development and continued change (Patton, 2010). Complex projects managed in a linear way often miss their mark. Further, if not grounded in context they risk being irrelevant to people they seek to help. Grounded theory is ideal for a complex understanding of context that need dynamic projects. As the context is understood and programming is developed greater understanding leads to simpler management processes. Being able to name complex systems makes what was unknown become common. A Theory of Change: Grounded and Complex. Often project designs come from previous projects. Previous projects are developed from projects before them. The cycle continues. Learning –if captured- comes from past projects leading to the next project. This learning is not invalid -but limited. It is limited because the early project design often lacked grounding and quickly becomes aged past it’s usefulness. The core development questions of power and people’s capabilities -shriveling or thriving- fail to be asked. This creates lack of congruence in design, operations, monitoring, evaluating and the context in which it is a part. We fail to understand what should be changed within the context, thus we fail to monitor and evaluate these key tipping points. Grounding the Theory of Change to Create Tipping Points. Rich qualitative data emerging from people’s experiences is vital to understand change. People’s narratives create the evidence that is needed to guide programs. The following is a short description of a method used to create a grounded theory of change. Corbin and Strauss’s (2007) overview on grounded theory was modified to develop a method for creating a theory of change that is grounded in context. Starting Point. The starting point is a research design based off what change the researcher or organization would like to understand better (see figure 1). The design leads to collecting data. The data is turned into codes. A code is a short phrase that represents quotes or sections from the data. All sources of data are important i.e. past organizational experience, literature, secondary data, and primary data. The various codes eventually become a set of codes. The set of codes is used to tag the data. As the set of codes is nearing completion, the researcher begins to develop sub-categories. Sub-categories are groups of ideas that emerge from quotes. Sub-categories become larger categories. For example in a recent project the subcategories of women being trafficked, men not paying child support, church and gender based violence, foreign men leaving the country after national partners become pregnant, women abused by lack of protection in the private sector, and opportunities for women and solidarity economies emerged from the data. Each of these subcategories had multiple data points within them to confirm their validity. These subcategories all fit under the category of Gender Justice. Gender Justice became the umbrella category. Saturation. Saturation happens through gathering data that represents the subcategories. Saturation can come from secondary or primary, quantitative or qualitative data. As subcategories develop they are filled through saturation. Saturation creates the needed evidence base and answers questions that arise during the analysis. Tracking data. Tracking categories is important to confirm the trustworthiness of the research and to see what is emerging. This process needs to be transparent and easily explained. Qualitative analysis soft wear is ideal for development of the research and tracking the data. Memo’s –which most qualitative programs use- are written and connected to categories and quotes. These memos provide the bridge from the analysis to the data. Turning the Research into a Theory of Change. There is a temptation to jump into the theory of change before allowing the data to emerge. It is important to capture the idea’s of possible tipping points at the same time as holding off on developing these thoughts. Waiting to create the theory of change allows time for empathy within the research team. Empathy –connecting to the emerging data- is vital for understanding change. Allowing time in the process of analysis also allows for themes to emerge. The researcher or team mulls over the data while it is being collected. They look for commonalities and possible streams which at first glance were not seen. After saturation the categories become key tipping points. Tipping points emerge through analyzing the categories for commonalities. Considerations for Theories of Change. There are two main considerations when developing the Theory of Change. The considerations are grounding theories of change in context and making them manageable. Context- developed categories turn into two to four tipping points. Tipping points reflect enough evidence to suggest changing a specific point will have substantial influence on the larger system. Manageable- the selected tipping points need to be manageable for the organization facilitating the change. Double-Checking and Further Developing the Theory of Change. After creating the first set of tipping points grass-roots experts work with the tipping points to check their accuracy and develop them further. Participatory tools such as ‘power analysis’ or ‘creating change systems’ for each tipping point work well to turn tipping points into theories of change. Corrosive or Fertile Cycles. Fertile cycles are cycles of good leading to good. Corrosive cycles are cycles of bad leading to bad. These cycles are fertile or corrosive because they emerge from tipping points. Increase or decrease within these cycles will create large amounts of change for the larger social system. “If our organization increases focus on (tipping point 1) through doing (strategy) we will increase (outcome) with (partners). Because of the increase with our partners the (secondary outcome) will also increase with (secondary influence actors). As the fertile cycle is successful it will lead to strength in the overall cycle which will strengthen (impact statement)”. Changing the Theory of Change Through the Life of the Project. The logic of the theory of change needs to be clear and easily changed. As the project develops stories are used to track changes. Through the life of the project use the framework of the theory of change with what is actually happening. This will show if the theory of change lines up with reality. Monitoring uses quantitative and qualitative data to tell the story of change and ensure the theory of change lines up with reality. Direct and indirect influence. For monitoring and evaluation it is important to realize the organization running the project only has direct influence on the primary outcome. 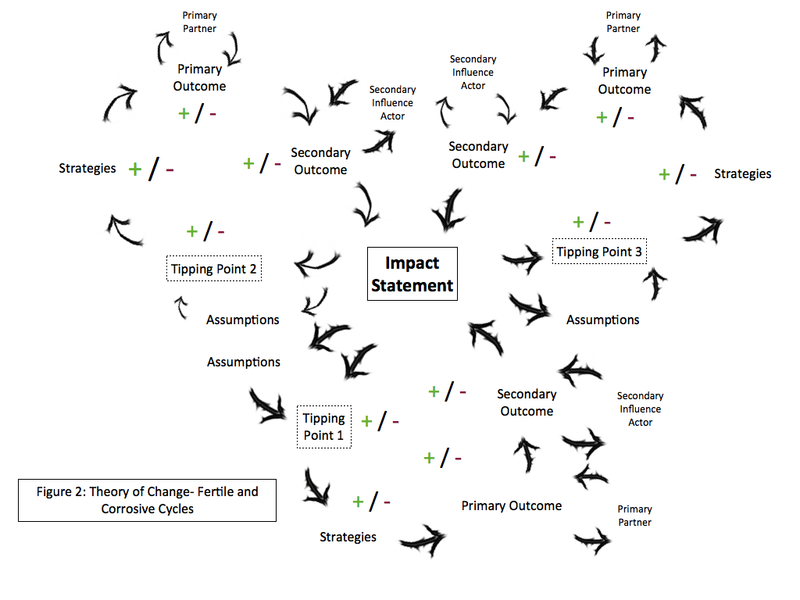 The secondary outcome (and influence actors) are identified to show the extent of the theory. Secondary outcomes are monitored to see what changes the outcomes are leading to in an indirect manner. As the team developing the project begins to understand what works and what does not work the operations shift. Understanding moves operations from being complex –low social agreement and low technical expertise- to complicate –either increased social agreement or increased technical expertise. What was originally complex eventually becomes simple –high social agreement and technical expertise. As the evidence is developed the project is scaled to increase change within a larger system. Note: Dr Matthew Will has over a decade of International Development experience. He has lived and worked in the Philippines and the Solomon Islands. He currently resides in Timor – Leste. The model posed in this article is grounded in necessity of development practice. This article was the result of two projects. The first was a project in the Southern Philippines done with the University of the Philippines which posed a resilience framework with domains and tipping points for people who face high levels of conflict. The second was a project in the Solomon Islands done with Oxfam which created a Theory of Change for increasing peoples voice. Another article that used Grounded Theory is The Model Flourishing. Previous post The Gendered Results of Conflict: “We Live in Hell” vs. We were “Revolutionaries”.